I love this little laptop. I really do! I bought it on eBay. I wasn't planning on buying a little mini-laptop. I was just looking for SRAM cards for my Poqet PC. I found an auction for the MB-15 which included the SRAM card I needed. I won the auction, and just figured that the Lexbook was a bonus I would just set aside. How wrong I was. 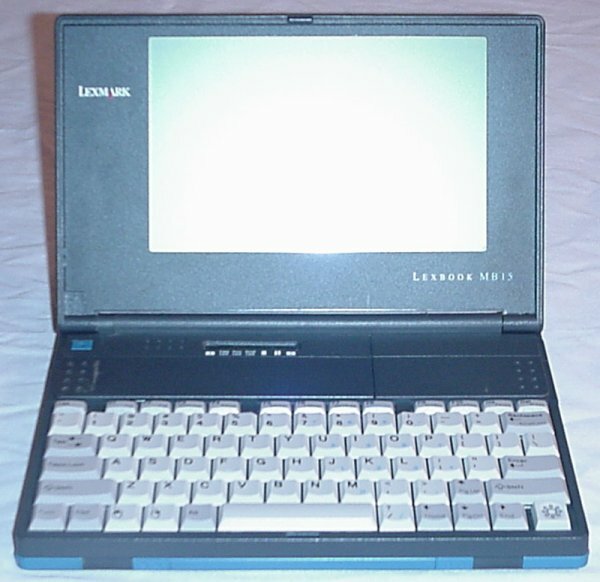 The Lexbook quickly became my favorite computer, and one that I frequently used. The screen, while monochrome, is sharp and big enough to show 80 columns by 25 rows with legible characters. (Something at which a Poqet PC fails.) 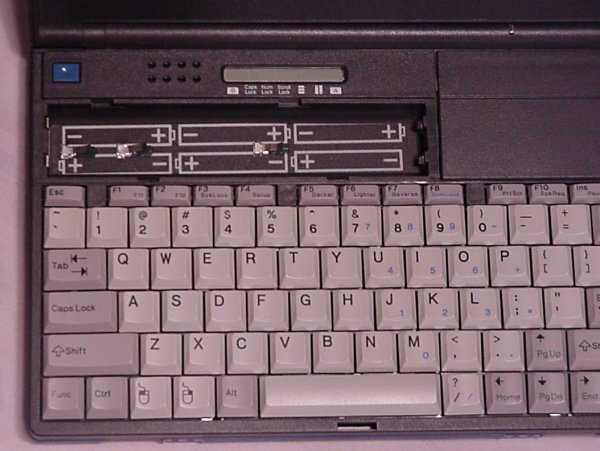 The keyboard is slightly smaller than a full-size laptop keyboard. Which makes it perfect for me. (Although I'm a strapping six footer, I have surprisingly short fingers.) It runs on plain old AA batteries. (Albeit six of them.) And you can slow down the CPU clock for longer battery life. It supports digital sound, although only the old Disney SoundSource format. And it has a mouse key that moves in eight directions to control a mouse. It holds two SRAM cards at a time. And it has both serial and parallel ports, and a built-in 9600 baud modem. It's small. It's light. It's all solid state. It runs forever on a set of batteries. What more could you possibly want in a DOS-based laptop? Memory-wise, it packs a whopping meg of RAM, which it separates into a boot partition (C:) and a data partition (E:). It includes Stacker in ROM, so it compresses the E: drive. Since I mainly used it for writing, I was able to pack way more that 2 megs worth of text in the data partition. It also comes with DOS 5.0 in ROM. Sadly, it's on the blink. Something has gone screwy with the power supply. I put in six fresh batteries, and a couple days later, not only were the batteries completely dead, but a strip of the plastic casing was vaporized away to the bare metal. That's right. Each battery had a quarter inch strip of plastic missing from end to end. Freaky! If anyone actually has one of these, I'd really like a replacement! This close-up shows the battery compartment for the six AA batteries. There's actually a rechargeable battery pack that fits in here, but it no longer holds a charge. There's an SRAM card slot at each end. The blue rectangles with the two dots each slide to the sides to eject the cards. You can also see the modem jack towards the back. Here's the back edge. Notice you have both parallel and serial ports. The parallel port is broken. To the right of the ports is a sliding door that slides over the ports to protect them. Here it is all closed up. The little dots near the edge are small depressions to let you get a better grip on it. Click here to view all comments for the Lexmark Lexbook MB-15 and to leave your own. Click here to view comments about other Lexmark computers.